Travel back in time and visit one of the continent's most romantic destinations aboard the iconic Venice Simplon-Orient-Express train. Leave London aboard Belmond British Pullman, enjoying a Bellini brunch, before a luxury transfer to Calais where the most stunning art deco train, the Venice Simplon-Orient-Express, awaits. Get comfortable and, as dusk sweeps the countryside, savour four refined courses prepared by expert Executive Chef Christian Bodiguel and skilled team. 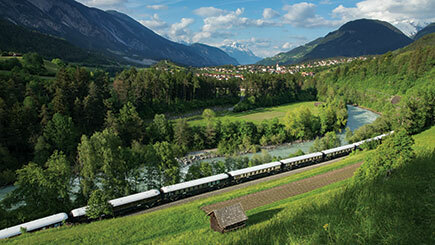 Retire to an opulent cabin to rest, or retreat to the Bar Car for one of the many cocktails and night caps on offer. The new day brings breathtaking mountain views; breakfast served in the cabin; a three-course lunch and an afternoon tea just before arrival at Santa Lucia. Selected Thursdays and Sundays from mid-March to mid-November. Owing to popularity and limited availability, booking as far as possible in advance is recommended and bookings are subject to availability and limited running dates. Minimum age is 18. If a vegetarian meal is required, please advise at point of booking. Smoking is not permitted on board. The trip departs London Victoria at 10.45am and arrives in Venice one day later at 6.25pm. Receive tickets, confirmation of departure times and a full itinerary by post shortly before the departure date. Also see 'Downloads' below for full itinerary. All seating is allocated subject to availability on the day by the supplier and cannot be guaranteed. You can never be overdressed aboard the Venice Simplon-Orient-Express! Smart wear is encouraged at all times. Please do not wear jeans, shorts or trainers during the day. Gentlemen are required to wear a jacket and tie at dinner. This trip is one way and does not include return travel. The voucher may also be used for a Venice to London trip instead (also one way).